Our long years of experience in the oven cleaning business in Haringey have thought us what our customers expect from a professional cleaning company and how to provide them with it. We have been able to assist a large number of households throughout the neighbourhood for more of 15 years since we first started and our services keep improving, letting us to offer the highest industry standards! If you want to see what our oven cleaning technicians in Haringey are capable of just call us at 020 8050 2865 and a person from our call centre staff will try to find the best possible time and team for your property and oven in particular. We do our best in order to offer our clients the most affordable prices and if you call our number, you'll see that for yourself. We always try to get our clients their money's worth when it comes to oven cleaning and so far we've been doing a good job satisfying almost all of them in Haringey. 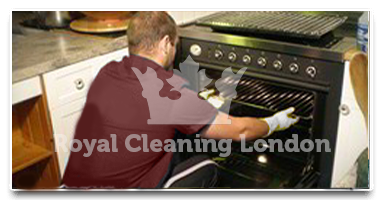 All of our oven cleaning clients in Haringey are entitled to the 200% guarantee policy of Royal Cleaning, which means that if the oven cleaning was not from the highest possible standard and was not enough to satisfy the customer, he can call and request a free re-clean if 48 hours have not passed yet. For most people oven cleaning is a tough task and they don't like doing it themselves. If you're one of these people, then you're just like me and in case you need someone else to do it for you, there's no one better in Haringey than Royal Cleaning. These are simply the best cleaners that you could hire in the borough and as far as I've heard they cover other areas too! If you have been cooking things that get your oven messy and you need it cleaned properly, but hate the cleaning process, you could always count on the oven cleaning specialists that Royal Cleaning has in Haringey. They will not disappoint even customers that have really high expectations and that's why I love using their services.